Rohde & Schwarz FPC1000 analizzatore di spettro con range di frequenza da 5kHz a 1GHz, risoluzione 1Hz, DANL -150dB (espandibile a -165dB aggiungendo l'opzione pre amplificatore FPC-B22). Outstanding quality and innovation does not have to come with a high price tag. 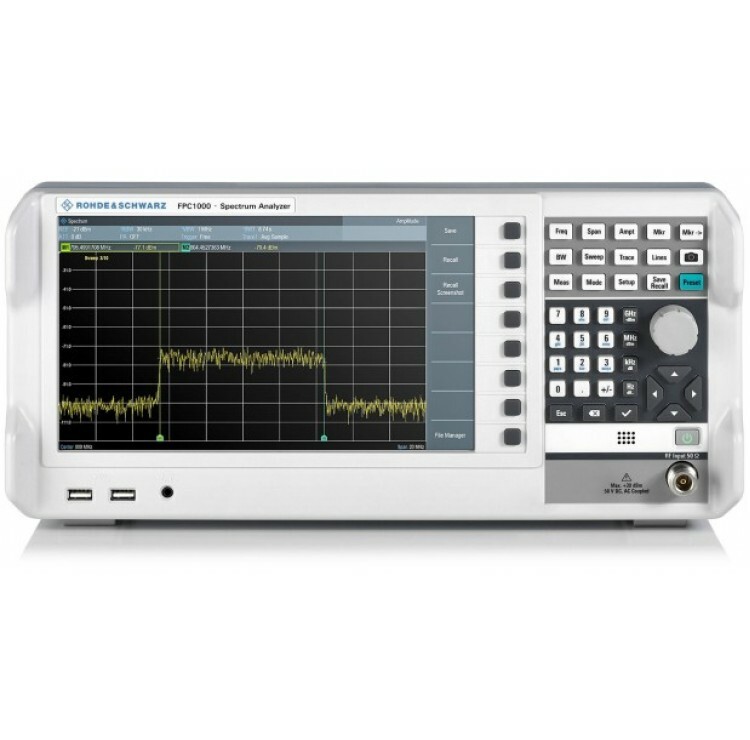 The R&S®FPC1000 spectrum analyzer delivers unexpected performance at a budget-friendly price. Engineered in Germany and designed to the same quality standards as high-end instruments. Measure with solid RF performance and benefit from a future ready, software upgradeable feature set. The R&S®FPC1000 has the best display in its class. The R&S®FPC1000 can be controlled via smart wireless remote control software. Excel with these features when using spectrum analysis in education, production, service or basic research. Investment protection, high resolution and easy virtual control. These characteristics make the R&S®FPC1000 spectrum analyzer the perfect tool for university laboratories, basic research as well as production and service facilities. Investment protection through software upgrade capability. The R&S®FPC1000 base instrument has a frequency range of 5 kHz to 1 GHz. Keycode options unlock higher frequency ranges up to 3 GHz or enable other features when required. See more details with high resolution. The R&S®FPC1000 features the largest and most detailed display in its class at 10.1", WXGA (1366 × 768 pixel) resolution. The display is 26% larger and has a 160% higher resolution than other instruments. Virtual control enables remote control and measurement. The R&S®FPC1000 supports wired Ethernet and wireless Wi-Fi connectivity. R&S®InstrumentView for Windows as well as the iOS/Android app-based R&S®MobileView plat- forms enable remote control and measurement anytime, anywhere.